Blog-like blogs here. Short, even prattle. Hence, this folder of brief miscellany. I have not read every paragraph in the continue revelations of legal phone and other electronic snooping that began last June when government secrets brought to light by Edward Snowden were confirmed and published in leading newspapers around the world. But I stay pretty current on it as well as study the journalistic underpinnings and ethics girding this significant topic. Still, a blogger or columnist these days could take the term “daily diary” as inspiration to motivation for writing. Also, another insight from England, a coinage from the satirical sci-fi movie The World’s End — the verb “starbucking,” meaning the commodification of small shops, cafes and, in this show, pubs. Speaking of the National Security Agency, it has a children’s website, www.nsa.gov/kids. Seriously. And it opens just fine, despite the federal government sequester. Here’s a slight expansion of that. You often get some form of what you ask for; if you squint, it’s true often enough. Thus, you can wish bad things into existence. games and lose in more serious matters. I came up with the “watch” tangent (don’t Google it and tell me how many thousands came up with it first), after reading a story at Slate.com, “An Important Life Lesson from Blackjack and Baseball: You Gain More by Not Being Stupid Than You Do by Being Smart.” That’s a anti-author headline. It totally gives away the story so you don’t have to bother. Well, it is worth reading to see the science behind the theory. The NSNC Education Foundation met online Sunday, Sept. 29, for its formal annual session. The NSNC board itself met online Tuesday, Sept. 17, in a called session to accept a new set of by-laws. The reason was to ensure solid nonprofit standing in the eyes of the law, not to mention the Internal Revenue Service. The NSNC-EF remains a 501( c )3, and the NSNC is unambiguously a 501( c )6. The Sept, 3, 2013 episode of NPR’s Fresh Air featured jazz-influenced experimental composer John Zorn. Eccentric, as expected. But he had a fresh term for what people like creativity coach Julia Cameron calls “crazymakers.” Zorn calls them such folks “psychic vampires,” that is, friends or relatives who drag you down, or drain or frustrate you in your endeavors. Or simply drain your good cheer. My Beloved and I began reading Cameron back in 1998. Psychic vampire resonates. Great, thoughtful concept: There’s post-traumatic stress but there’s also “post-traumatic growth” — Dr. Norman Rosenthal in interviews promoting his new book The Gift of Adversity: The Unexpected Benefits of Life’s Difficulties, Setbacks, and Imperfections. “[C]oronary artery disease and heart attacks are nothing more than a toothless paper tiger that need never, ever exist. If it does exist, it need never, ever progress. It is a benign food-borne illness.” — Dr. Caldwell Esselstyn Jr., interviewed in the Pittsburgh Post-Gazette. What a way to view heart disease, and as a preventable condition, according to a number of specialists, it makes sense. Esselstyn was featured in the documentary Forks over Knives. It’s time for a change. 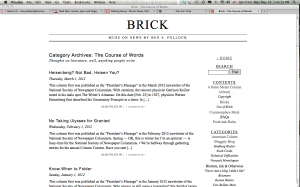 Way past time for the blog Brick. As of today, because I couldn’t stand waiting for July 1, the beginning of a quarter, or June 1, the next detail-fixated date, I have changed the theme of this blog. Theme is what wordpress.org calls a template. The theme organizes the overall look, the type fonts, the navigation (those indexes etc.). Thousands of them are freely available, because wordpress.org and the sister wordpress.com are gloriously open source. These are created by novice web designers learning their craft, master web designers “offering a taste” with more sophisticated, similar themes available for a price and so on — but to be made available through WordPress, they are rigorously tested by the WordPress community. That makes a difference. Brick has been managed under for essentially all of its eight-plus years (starting early 2004) is called VeryPlainTxt, by Scott Wallick. WordPress has improved its overall platform many times since Wallick’s last upgrade, in July 2008. I liked it because it emphasized the text and its similarity to the wonderful McSweeney’s Internet Tendency online journal. This new theme is The Erudite, created by Matt Wiebe. Classy, simply that. I’ve been mooning over it for a long time, wondering when to change, or if something better would come along. Yes, but not as appealing as this one. Like Wallick’s, Wiebe’s design has things I’d love to change. There is a way to do that. It’s dealing with the programming code directly. Most people I know who use WordPress or from-scratch (or nearly so) web designers prefer to customize. I have dived in for Brick and the handful of sites I’ve managed over the years to modify lines of code here and there. But I’d rather not. The sense of time passing disappears when I do it, and coders love that. I enjoy it, too, but that time is lost to where I’d rather lose track: working on the content. Sure I can design, but I’m a writer. That said, I will modify this site after a while, when I get a strong urge or, more likely, when I want a good excuse to procrastinate on a writing project. Ever wonder about those fancy coffees and other products that promise to donate 5% of the price to some worthwhile charity? First point is this seems normal for me, with 341 Facebook friends. Over three-fourths of my postings — I’ll send something up about 10 times a week — get no visible response. Responding to everyone all the time is not how Facebook works. Second thought is I might have overshot. I was subtly, maybe too subtly, commenting on the national debt crisis. The Washington compromise promised spending cuts but no revenue changes at all, not even closing loopholes. Taxes pay for things we all expect. They’re not voluntary so they have to be fair. Waste must be kept to a minimum, which requires continuing oversight. That’s here, and nationally. I want the ambulance here in five minutes, and if there’s a nationwide pension, defense and now health care, I’ll pay but it better be done well. So I didn’t buy sunglasses, shoes or even a ream of paper on School Tax Holiday Weekend, which were exempt from sales tax. I’m heading to Wal-Mart today (buying very few if any “school” supplies, incidentally). And pay my rightful share back into the community. What, not four? Others are punditing U.S. economy very well. In the HomeStyle section of the Saturday regional/state paper is the weekly Personal Space brief. Most weeks the subject, who is asked about her or his home and some biographical information, maneuvers to plug their business or charity. Tacky. Today, though, the homeowner of the week praises the property. My favorite space: There’s a road that leads up to our subdivision. It’s this great windy road that goes in between two wooded areas. … You come out of the city, and it’s almost like you’re in the country. That’s the American dream, in short metaphor. A tax-free weekend for school supplies runs today and Sunday. This column first was published in the August 2011 newsletter of the National Society of Newspaper Columnists. Instead of polishing this column, I should be sewing nametags into my clothes, shaking out my sleeping bag for WordCamp. More than 100 WordCamps are held worldwide every year. They’re cheap (mine’s $30 including food, drink and a good-size gift bag). There’s local speakers, at that price sure, but experts from Texas and California are coming in. They help WordPress users at all levels in a spirit of sharing and community (“open source” is the term). WordPress is free (open source) hosting software for blogs. But it’s grown to where full websites of major companies and nonprofits — not just blogs — use it (New York Observer, Le Monde, Anderson Cooper 360, even Martha Stewart’s blog). Our www.columnists.com is built on a WordPress platform. This will be my second WordCamp. Earlier this month while being a smart-alec I realized — too late — I could’ve been a presenter, on content and use of tools. This is a reversal. 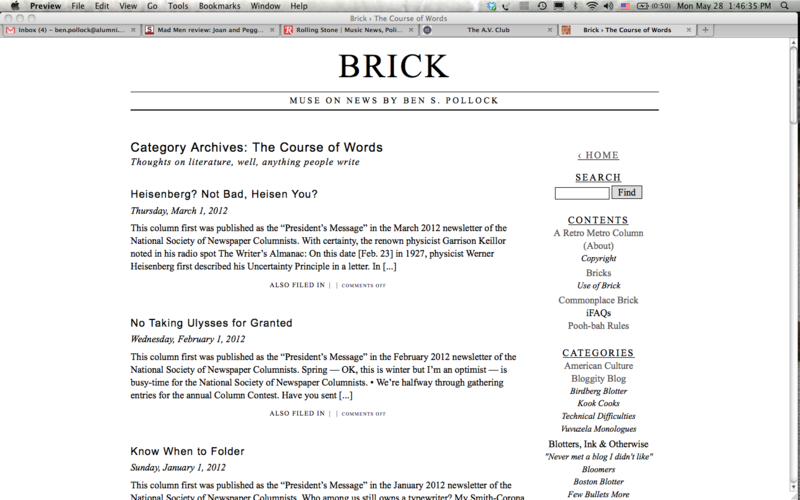 Brick is all about the new. Live in the present, look toward the future. Dwell just a little on what’s past. 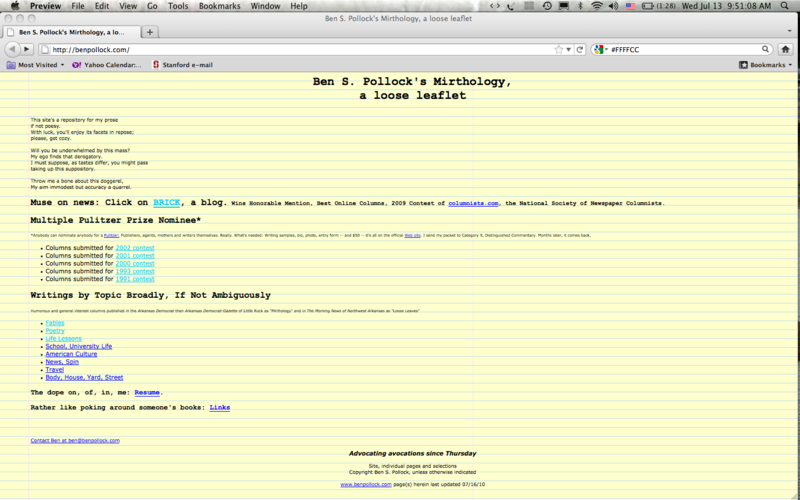 But the URL from which it sprang, benpollock.com, has been neglected. Oh, I tell myself, it’s an archive. It works well enough. Fast-loading, a reference for me when I am writing far from my files at home. Perhaps occasional readers of Brick head back there to see earlier work. Usually I think these old essays get opened because of obscure search keywords people type into Google. As for me when I have reviewed its contents, it looks like a pile of junk. This past spring, however, I dived in, to ensure I wasn’t repeating myself in a new Brick, and saw lots of good writing, good organization and even wit. Amid only a few clunkers. Logical enough. “Leave well enough alone,” my late Uncle Al Pollock was fond of saying. The website that appears before the forward slash, benpollock.com, is an archive of some five dozen columns I wrote for newspapers, real newspapers. 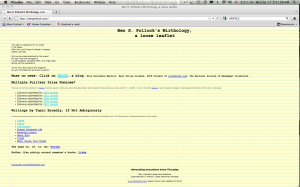 The website looks like it was built in 2002, because it was. Pure html code, not a lick of CSS, which was not widespread yet (if not in common use, it wouldn’t work for most people’s computers). No frames or other bells and whistles, though. I always liked a clean look. The yellow legal-pad image indicated my preference for writing longhand. Almost 10 years later, though, and you can almost see the edges curling from rot and smell the mildew. Facts belie the logic. Analytics indicate all sorts of people go there and open the supposedly greatest hits of my late ’80s-early ’90s newspaper columns, collectively called Mirthology, and my 1/1999-9/2001 newspaper columns collectively called Loose Leaves. Plus a few guest columns. These two standing heds indicate my goals, humor in the first and mixed topics for the latter.